This report spotlights the native plants and wildlife most at risk of being lost to extinction in Canada . The report was prepared by NatureServe Canada and provincial and territorial Conservation Data Centres, and was supported by partner organizations, including Parks Canada and the Nature Conservancy of Canada (NCC). The report presents findings on the global conservation status of 13 groups of species — from mammals, birds, reptiles, turtles and amphibians to freshwater mussels and flowering plants. The report assigns a global conservation ranking that ranges from presumed extinct to secure. On Guard For Them aims to improve our awareness about these species and focus conservation efforts to ensure these species are protected. On Guard For Them presents findings regarding the global conservation status of 5,457 species and 1,751 infraspecies native to Canada. Since 1844, at least 109 species and infraspecies in Canada have vanished, but continue to exist in the United States and/or elsewhere. Six that could only be found in Canada have been lost over that time and are presumed extinct. Infraspecies includes sub-species and genetic varieties of species. Canada has 128 species and 85 infraspecies that are endemic to the country and that are of global conservation concern. Twenty-seven of the globally at-risk species and 11 infraspecies span three or more nations and as a result require multilateral cooperation for conservation success. In addition, the critically imperilled Peary caribou, in the Northwest Territories and Nunavut and reported from Greenland, requires bilateral conservation cooperation between Canada and Denmark. This report provides an update to NatureServe Canada’s Our Home and Native Land, a 2005 analysis of the conservation status of Canadian plants and animals in a global context. Rainer, R., Bennett, B., Blaney, S., Enns, A., Henry, P., Lofroth, E. & Mackenzie, J. 2017. 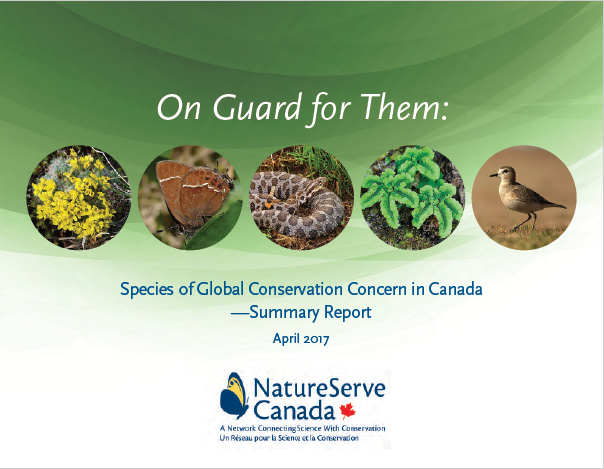 On Guard for Them: Species of Global Conservation Concern in Canada. NatureServe Canada: Ottawa, ON.